EDI messages (Baplie , Movins , Coarri , Codeco and TPFREP). 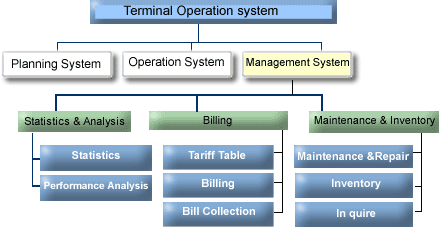 Management Information system (reports & statistics). Port Said Container & Cargo Handling Co. (PSCCHC) clients will dispose of a powerful terminal system prepared to cope with ship lines demands in all respects. An Internet access to PSCHIS provides the Agents or the Ship Lines over the world with real time reports for their containers or ships. Vessel Arrival Notice - voyage information. Receiving/sending Baplie, Coarri and Codeco messages. Graphical interface for all vessel operations and planning. 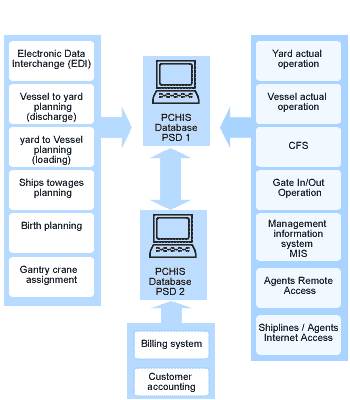 Graphical actual berthing and operation monitoring & following up. Real time Gantry Crane and Berth productivity monitoring & following up. Discharge sequence in berth side. sequence on board of the vessel. EDIFACT CODECO (Gate Movement EDI message). Stuffing and Stripping of containers. Empty daily shift from depot yard to terminal yards. 4- RDTPSCHIS has a 53 TEKLOGIX Model 7035 ,7530 G2 Radio Data Terminal (RDT)with two antenna to cover inside container terminal and external depot area - a circle of 5 KM diameter – with no data traffic problem. Real Time access and Data input to Terminal Data Base –our terminal operators from their original locations could achieve PSD1- with high-speed communication during actual operation. Shifts on board of the vessel. Receiving Containers from Vessel On Yard. Exit Container from Yard for loading vessel operation. Shift containers From yard to yard or in same yard. Container tracing . Sending message to control room. Each movement recorded as planed, and signature by operator ID, and the time of movement.Using RDT increasing Terminal productivity. BAPLIE – vessel storage data. MOVINS – vessel loading plane. COARRI AND CODECO – container movements in/out from/to GATE and VESSELS. Our staff has a good experience in receiving and sending Electronic Data Interchange messages, They can solve any problem and advice if needed. Different containers reports according to status and/or container type and/or stuffing/and un stuffing Date. Operation analysis reports and statistics. Real Time Gantry, Terminal and Berth Productivity. Berth Planning and Operation Estimations. Lan And Wan Network (frame relay tech.). 53 Hand Held Terminal Teklogix Model 7035 ,7530 G2. Area To Cover, About 5km.